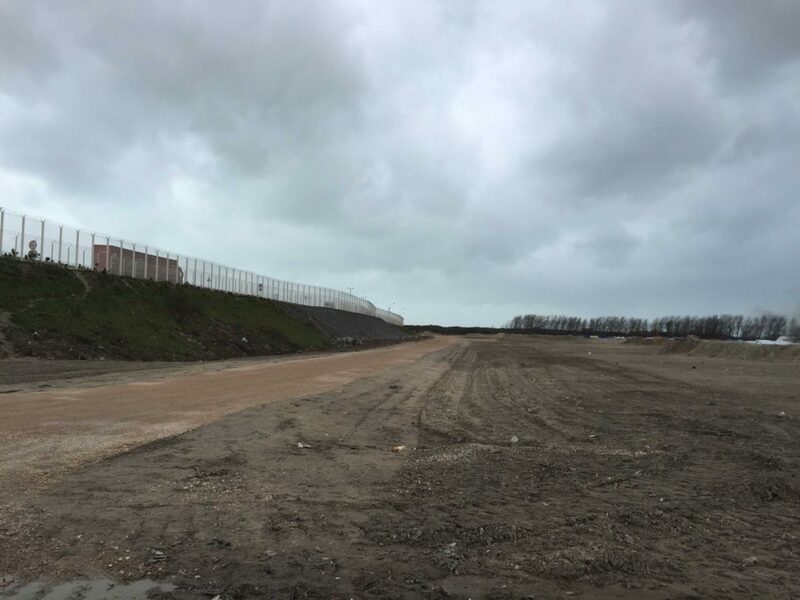 I went to Calais yesterday. It’s quite hard to describe how it feels looking across areas of land that were home to so many people and, in three days, are now bare. 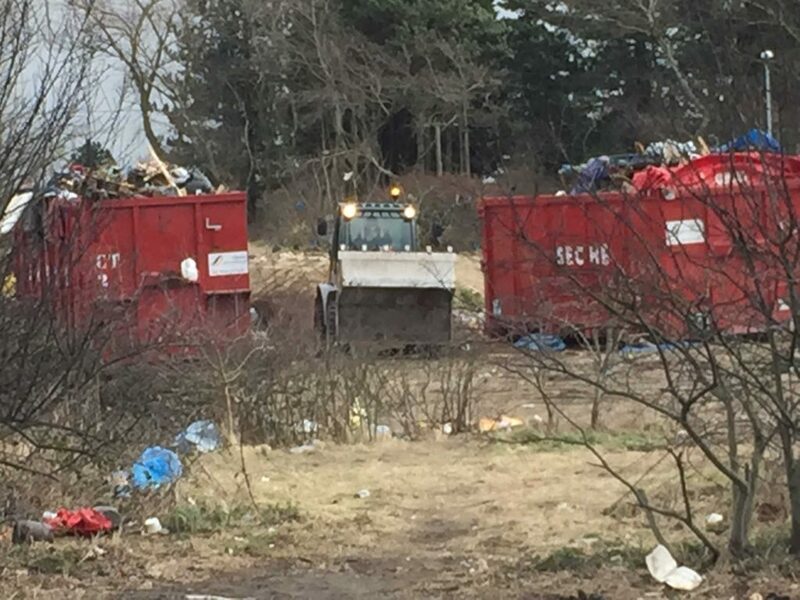 In the southern part of the camp, where the bulldozers were still dumping the contents of people’s makeshift houses into dumpsters, reminders of the community that once inhabited this patch of scrub land lie strewn across the mud and turf. 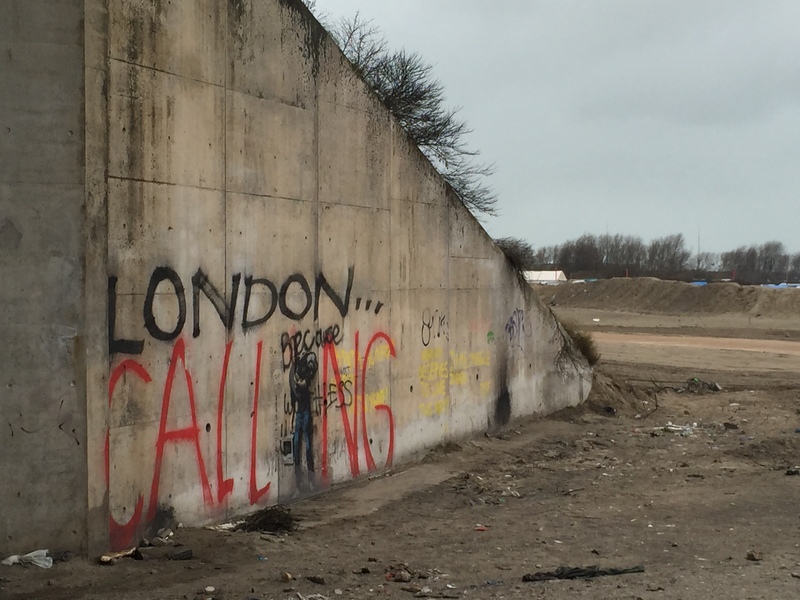 However, beside the entrance, iconicised by Banksy’s ‘London Calling’ artwork featuring Steve Jobs with a sack on his back, no trace of human habitation remains. Bulldozers move slowly, combing the earth as if preparing the foundation for a new construction. But having seen the life that was there before I can’t help feeling instead, like they are covering up a graveyard of lost souls. Where are these people now? 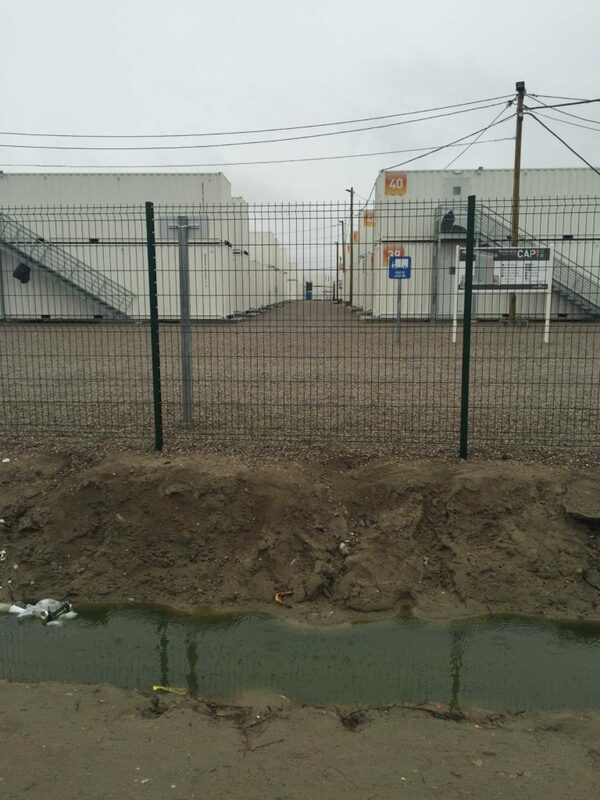 Some are in the huge, white containers that sit like industrial storage boxes behind barbed wire fences and a moat. 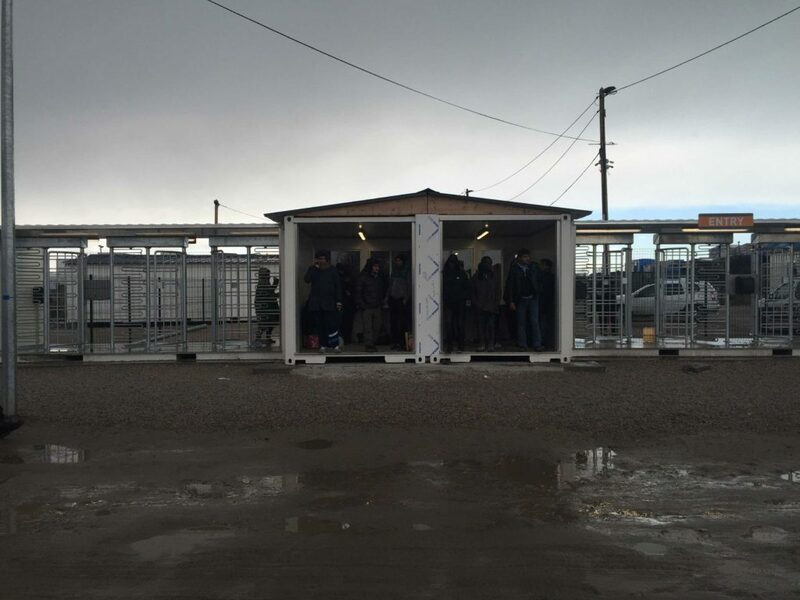 Despite the displacement of an estimated 2,000 people this week there are still 600 spaces available. Entry is by palm print and many people are concerned this will constitute registration in France, although the authorities deny it. I watched as figures move from box to portaloo and back again. 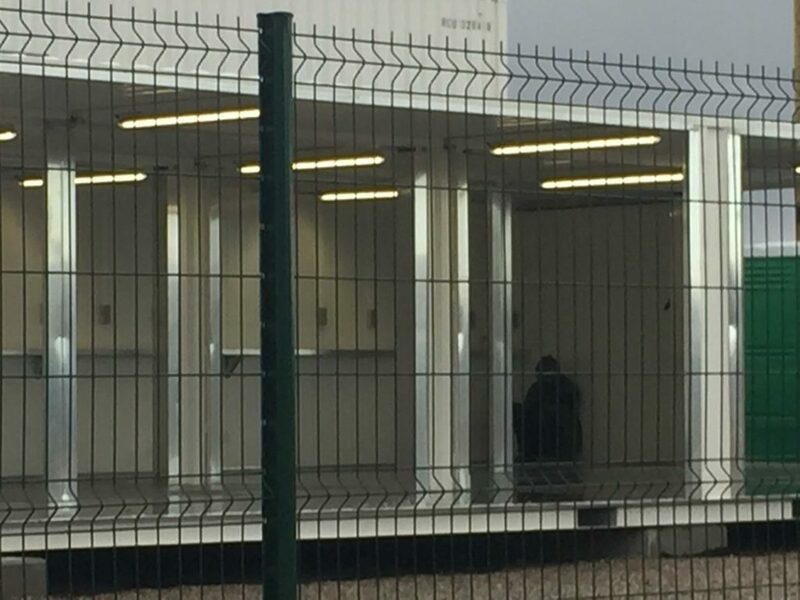 One man sits with his back to the wall in a container with one wall removed, presumably to create a communal gathering space. Instead, this lone, dark figure huddled against a white, sterile background reminds me of a patient in a mental asylum. The middle of the camp still remains. The Women and Children’s Centre is functioning, the church, the library and the school are all in tact. I spoke to Solomon who built the church and who I met on one of my previous visits. Solomon is from Ethiopia, very tall and very strong with a bright white smile and a scar across his eyebrow. 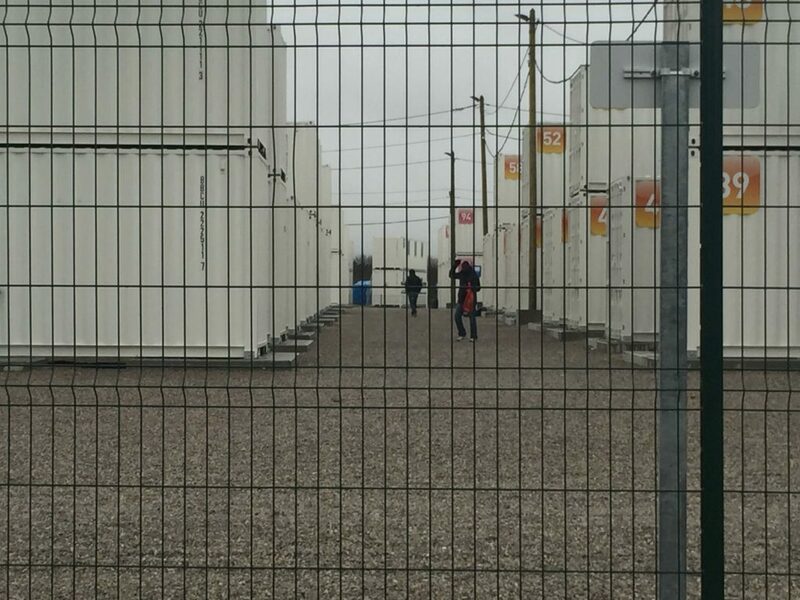 Apparently the French judge in the appeal case ruled that only non-inhabited structures could be destroyed and the communal spaces must be spared. But huts were torn down anyway, so he doubts the church will remain standing for long. Solomon asks if I would like to join the community meeting taking place in a large tent just beyond what used to be the Syrian section. At the start of the meeting the young woman in charge asks us all to observe a minute’s silence for a Sudanese man who had died of a heart attack in his tent a few hours before. After the meeting, I followed two of the community leaders, both Afghan, to where the funeral was taking place. 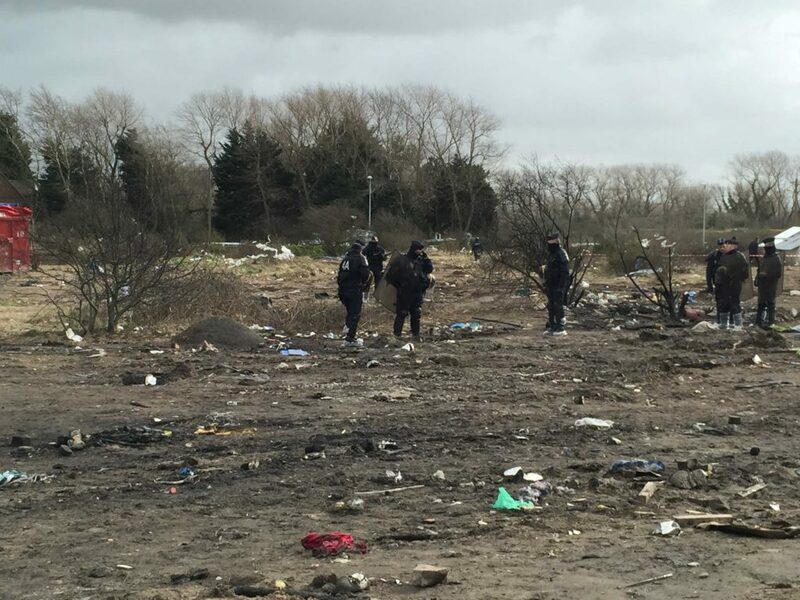 French riot police stood in front of the entrance to a tent where his body had been washed in accordance with Muslim burial traditions. We stood for a while in the bitter cold, the North Sea wind lacerating our faces and our hands, and waited for something to happen. More and more people arrived to pay respects but nobody could enter the tent. And then a group of men started talking in Arabic, some Middle Eastern, some Afghan, some African, and finally it was decided that a prayer should be said. Everybody cupped their hands while a prayer was recited and then put their hands to their face. We slowly peeled off as a hail storm began gathering apace, and I thought about how profound that moment was. 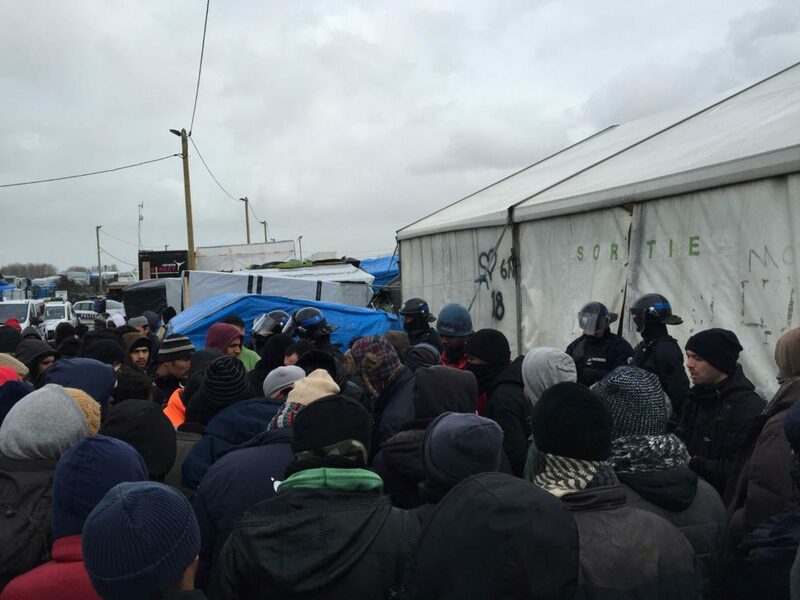 The French authorities have been organising buses to take residents to other camps around France. However, according to NGO workers who are trying to co-ordinate alternative accommodation, few seats on the buses have been taken. 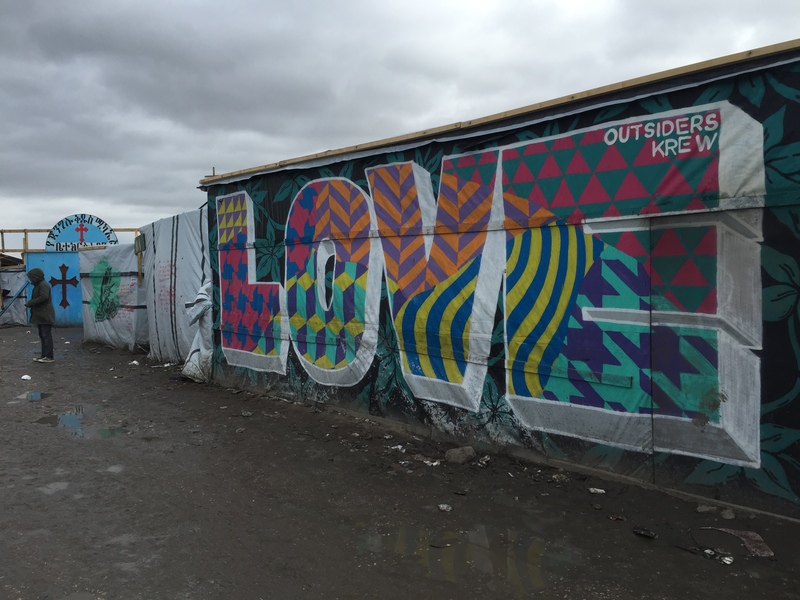 Most people have walked out of the camp in the same way they walked in: with a small bag and the whisper of another place they might seek refuge. When I was in The Jungle at Christmas and then again briefly on 7th January, the mood was light. Restaurants were busy and shanty-town businesses were popping up all over the place. 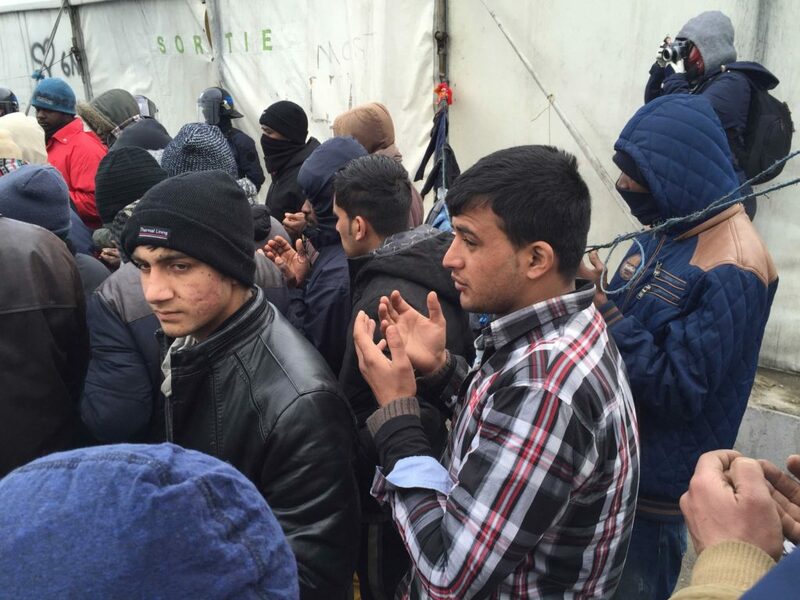 The majority of people were trying most nights to get to Britain and for many, the agony was palpable. But during the times in between there was a community wrapped around them. Young Brits were coming across in droves, often with nothing but an overdraft to sustain them, some to build plywood huts so that people wouldn’t die of exposure, others to cook, sort donations for the distribution vans that would arrive at scheduled times each day, teach English or to proselytize on behalf of their God. Some went to play music or to take photos. Others went to talk to people, record their stories so that what was happening could be related to the outside world. Now all this has gone. Looking through my photographs, I notice someone had scrawled across the Banksy piece, ‘Because Worthless’. It must feel like this to those who have been displaced yet again. But, having visited The Jungle five times since last September, I can honestly say that people didn’t feel worthless in there. Like the funeral for the dead Sudanese man, people showed up: to give food, to share warmth or to impart happiness, however short-lived. What happens to these people now though, is really hard to know.